In January 2017 the superyacht M/Y Silentworld set out to seek shipwrecks previously undiscovered, with owner, guests, and representatives of the Australian National Maritime Museum aboard. What they found had lain unseen by humans since the 19th century. Our expedition was 12 months in the planning, and took place over 10 days in January 2017. 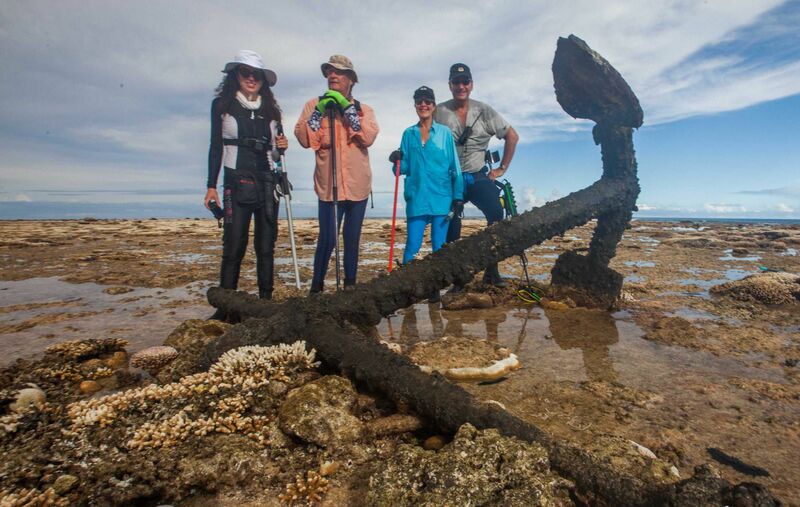 Not-for-profit organisation The Silentworld Foundation collaborated with the Australian National Maritime Museum to send eight guest researchers and eight crew members to find lost clues to Australasia’s maritime history. The five maritime archaeologists on board Silentworld had zeroed in on Kenn Reefs, which were discovered on 3 April 1824 by Alexander Kenn, master of the ship William Shand during a passage from Sydney to Batavia (modern-day Jakarta). The reef complex falls within the oft-travelled ‘Outer Route,’ a seaway used by 19th-century mariners to avoid the Great Barrier Reef when travelling to and from Australia’s east coast. They sit off the continental shelf beyond the Reef, 280 nautical miles northeast of the Queensland town of Gladstone. 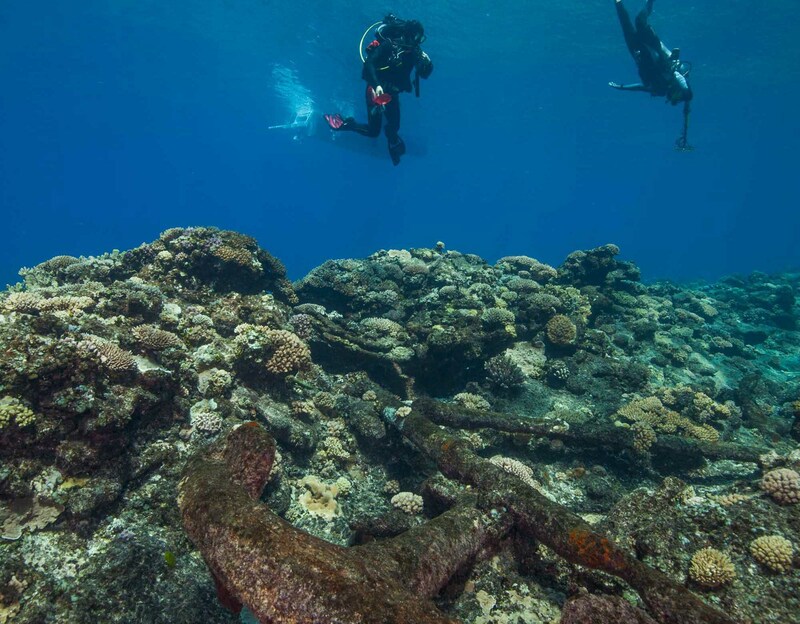 According to primary archival sources, at least eight vessels were lost on Kenn Reefs during the 19th century. One of them was Bona Vista, a wooden, two-masted brig, owned by Robert Towns. On a voyage from Sydney to Mauritius via Torres Strait, the brig was wrecked on Kenn Reefs on either 17 or 18 March 1828. Captain Robert Towns, passenger Thomas Underwood, and the crew of the brig spent several weeks on the reef waiting to be rescued. Twenty-eight hours after departing Bundaberg, we approached Kenn Reefs as the sun was rising. We sought a suitable anchorage close to Observation Cay, where the Bona Vista crew reportedly holed up after the ship came undone on the reef. It’s part sand and part broken coral, standing about two metres above sea level and stretching over 250 metres. After confirming the anchor was secure in 15 metres of water, we set up for the day and went in search of reminders of past explorers and seafarers. This was the initial phase of the expedition, to make a quick survey of the area before laying plans for the remainder of our time. Since the ships of the period were made of wood, all that would remain as clues were nails, sheathing, anchors, anchor chains, blocks, cannons, and more. We rigged our purpose-built tender for magnetometer runs. A magnetometer detects disturbances in the earth’s magnetic field, indicating the location of ferrous items like cannons and anchors that could be of interest. The device looks like a one-metre-long torpedo, so a tender can tow it without causing too much water disturbance. It can detect such metals far deeper than the conventional metal detectors the shore party used on the cay. There was a lot of evidence, and the artefacts weren’t concentrated in one area to indicate just one particular ship. How amazing to be able to see some of these traces from the past and try to piece together the history behind the discovery! It is an exceptional experience knowing that our team might have been the first to see these after the wreck. Finding items like anchors and cannons is fantastic because they are some of the largest pieces of the puzzle. The team returned to Silentworld to peruse charts and articles from the corresponding era, planning the next survey of the area, all the while enjoying the comforts on board. Calm seas and a gentle breeze from the north made great conditions for history hunting. We made an early start, everyone setting off in their respective parties ­– some snorkelling, others running with the magnetometer in the tender over areas of reef alleged to be the ships’ final resting places. We recorded some significant hits with the magnetometer in the morning in areas not previously associated with any wreck sites. The findings, like a ship’s bell, were extremely promising. Overnight at anchor, we had storms and thunder. There was not much wind associated with the squalls, but we were on the edge of two pressure systems. We waited for some of the weather to pass before heading out with the first research team and the magnetometer. The tender with the magnetometer ventured out to verify the location of the previous day’s findings. The plan was to reconfirm these findings and then dive there to discover what triggered such great data. Unfortunately, the area presented different data than yesterday. It was as if the wreck or the remains had disappeared. Was Friday the 13th playing tricks on us? There was no trace of the magnetic anomalies previously acquired, so the previous day’s findings remained a mystery. After lunch the Silentworld Foundation team scoured the reef edge in search of hints to the location of various recorded wrecks. The afternoon proved fruitful, especially with the discovery of some iron knees, the joints and elbows to which the timber attached. At anchor near the sand cay, we enjoyed a little surprise. 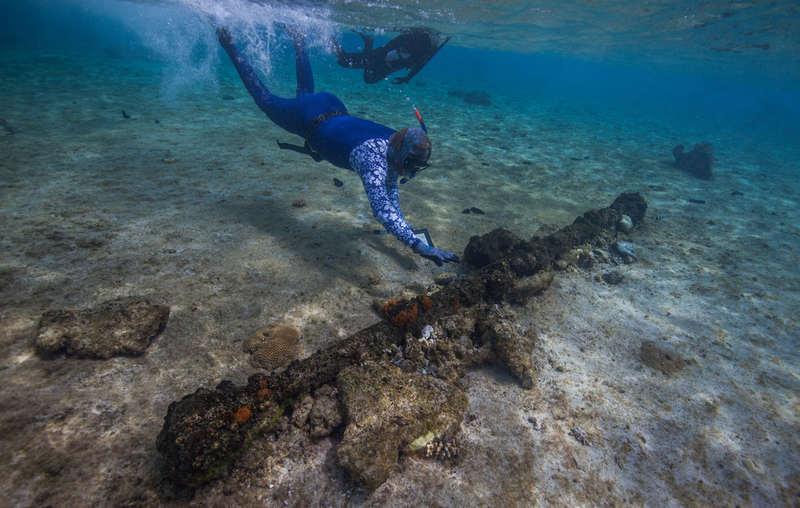 Among the remains of lost ships, there was new life: the nesting area for green sea turtles. A few of the Silentworld Foundation team ventured ashore under the full moon to watch a turtle lay her eggs. Later that morning the Silentworld Foundation tender, with the magnetometer in tow, ventured to the outside of the reef to survey the area. Because of yesterday’s significant finds, we wanted to see if any of the ship wreckage had washed back down the edge of the reef. That, combined with two teams of divers, yielded important discoveries and confirmation. We found anchors and a cannon. Clearly it was the site of a significant wreck, but what ship and who was on board were mysteries. The team returned to the outside edge of the reef. The prevailing winds here are southeast, so getting to this edge is sometimes difficult. However, weather conditions were perfect so far for the crew to scan it using the magnetometer and provide visual references. The day was full of surprises, with visual spottings of cannons and anchors. The team also found what is thought to be a copper alloy component of a marine toilet! 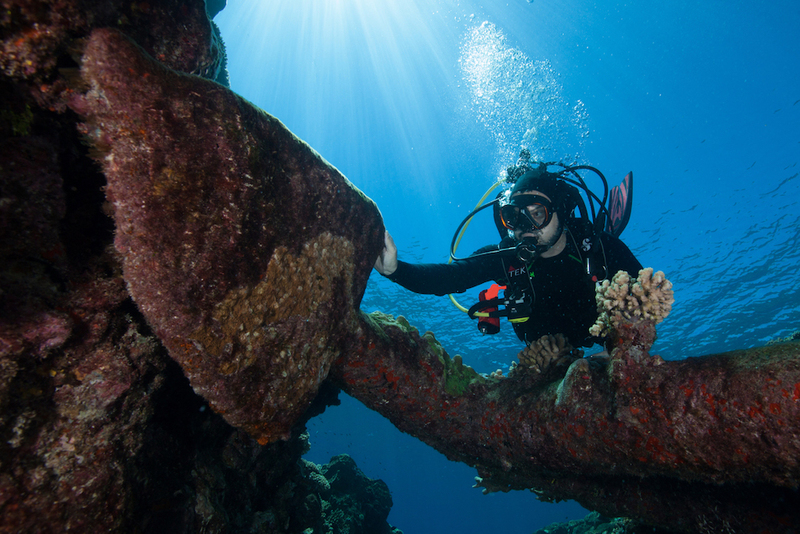 We documented these previously unknown wrecks for later identification. photographic evidence and carefully documenting activities and discoveries. Unfortunately, the wind increased overnight out at the reef, to 15 to 20 knots from the southeast. The swell was increasing, too. This meant the expedition had to come to an end. While en route back to the Australian mainland, Silentworld encountered a pod of seven Indo-Pacific bottlenose dolphins. The beautiful creatures rode our bow wave for around an hour before dispersing. We’d observed wildlife on Kenn Reefs, too, though mainly birds like boobies, frigates, and terns. In addition, our guests were graced with stunning sunsets and the full moon rising to illuminate Observation Cay and its pristine waters. The visibility while diving was beyond belief. A shipwrecking is traumatic. But when the dust settles, the remains have a powerful story to tell. They quietly describe the ship, the people on board, the efforts they made to save the ship or survive off it until help came, and what happened after it was abandoned. As usual for Silentworld Foundation expeditions, most of the wreck identification happens after the trip, as the archaeologists piece together the size of the items found, and identify any markings or shapes particular to certain ships from different countries. Silentworld is, in every way, a luxury superyacht, with delicacies provided by a private chef, an attentive crew of eight, and a suite of sea toys. We just happen to utilise her in an extraordinary way to make new discoveries. As such, we were pleased to receive the inaugural Voyager Award at the AIMEX 2018 Australian Marine Industry Awards. This kind of mission may not be for everyone, since the reef is quite remote. But, in terms of Australian history and wildlife, it was bountiful indeed. This account was written in collaboration with maritime archaeologist Irini ‘Renee’ Malliaros.